http://youtu.be/nkQNwkgH9dA Yes, our little guy is growing up so quickly and has just added another trick to his list, ROLLING! We have one final one piece outfit with a Cooper bottom. 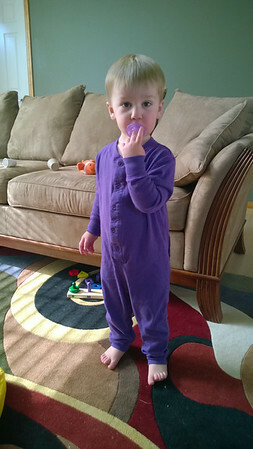 He topped off his outfit with a matching binky from Nicholas. Today Cooper is 26 months old. He is talking all the time now and continues to be more outgoing outside of our house. He enjoys waving to the neighbors and saying hi to random people. Potty training continues to be a success using a diaper for nap, overnight and requesting one to poop in each morning. Nicholas is a love/hate relationship. He loves to make him giggle and bring him toys, but hates when he takes up Mama time, especially for nursing. Favorite saying, “Me do it by myself,” when it comes to hand washing, buckling his highchair and many other things The previous attempts of me trying to help Cooper say his name resulted in him saying Ka, Ka, Pooper. I am happy to report that he is now able to say Cooper when prompted, but still says Pooper when saying his name on his own. 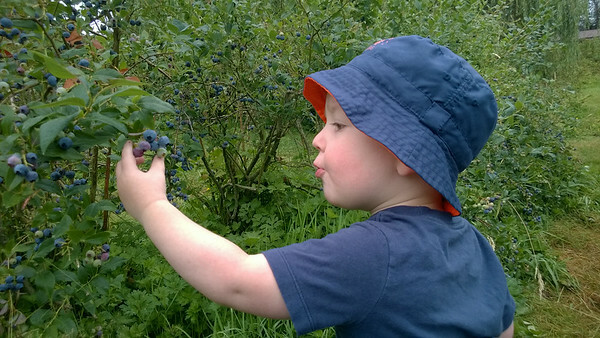 Cooper has loved picking the strawberries, blueberries and especially raspberries from our yard. When I found out my best friend’s extended family has a blueberry farm it sounded like a fun adventure. 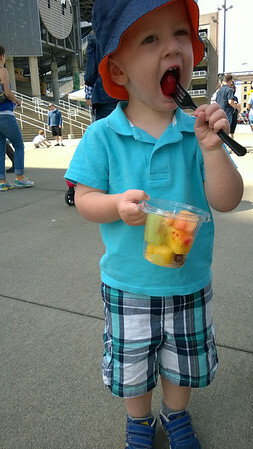 Cooper loved eating the blueberries. 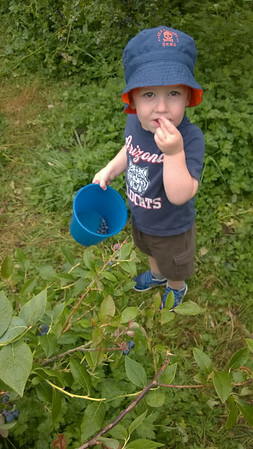 His bucket stayed about as full as it is in this picture even after 30 minutes of picking 🙂 I got a bit wrapped up in picking blueberries and didn’t recognize the potty dance from Cooper. This resulted in his first full pee accident since his first day of potty training. We cleaned up quickly and went right back to picking. Leg squeeze update: Third time is the charm. After a second time of what I thought was Cooper cuddling with my leg he again was actually pooping yesterday. I am happy to report that today I have finally caught on and knew what was going to happen next. 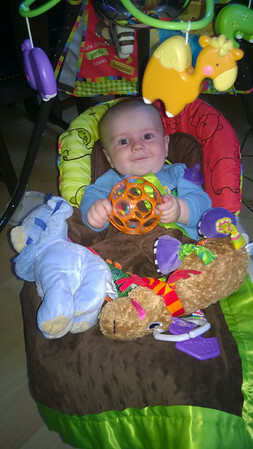 During Nicholas’ snooze in the swing Cooper “helped” him sleep by bringing him all of his toys. Nicholas was pretty happy to wake up to so much entertainment at his fingertips.